Newest Google Chrome browser. You can try other browsers, but we don’t test them yet. MightyEditor is open-source cloud based solution for creating and hosting HTML5 games. It is compatible with Phaser game development framework, but you can also use it with other tools. Main features of the editor are: asset management, map editing, code editor, data export. Why should I use MightyEditor? Having a browser based tool with all of the basic functionality of map and code editor allows you to focus on fast prototyping of games. Open a link in browser and you are good to go. There is no hassle with installing and configuring various software solutions thus saving your precious time. MightyEditor does not require your project to depend on it. All assets and code can be exported at any time. Whats even better – the editor is open-source and data can be moved to your local machine with local version of editor. The source code can be found on github https://github.com/TheMightyFingers/mightyeditor. 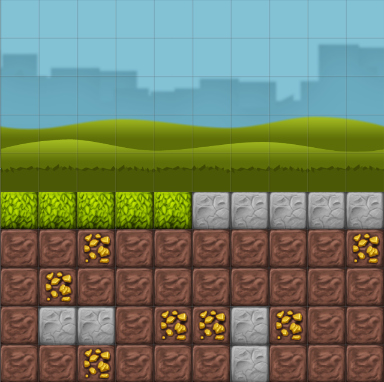 In this tutorial we will create a simple mini-game called Digger. The game is about a little miner who digs dirt block for gold and sells various minerals at the store. Arrow keys will be used for navigation and a simple physics and collision will be added to miner object. Open the link http://mightyeditor.mightyfingers.com. Enter project title – in this case it will be Digger. On the bottom right panel enter game dimensions: worldWidth, worldHeight 640 x 640. For sake of simplicity we will set view-port sizes the same 640 x 640. In the following part of tutorial we will use assets that you can download here. On the top right panel from select list use upload file option and add files. 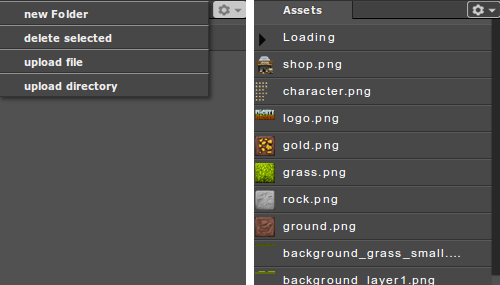 Alternatively you can drag and drop files on to the panel and the assets will upload automatically. Click stamp icon on the left tool panel and then select background_sky.png in assets panel and then click on map thus creating background (hold Ctrl button for snapping to grid). 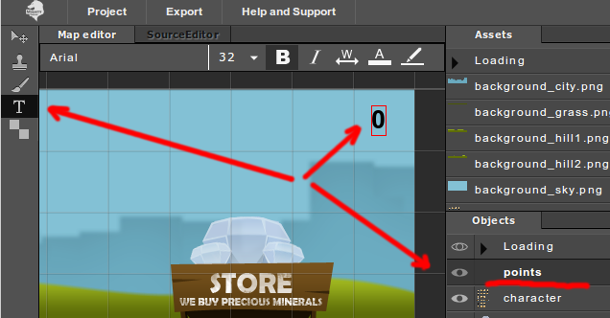 You can change position of background by selecting arrow from the left tool panel. 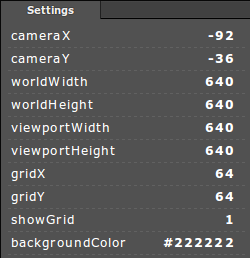 For more accurate positioning change x, y position in the settings panel. Let’s create group for newly created background objects. On right panel Objects section from select list choose Add Group. Rename group to bg and drag objects to this group. To drag multiple objects hold Shift key. Let’s create 5 rows of blocks under background. There are four different types of them: rock, ground, grass, gold. Gold blocks are collectible and you can’t dig rocks. Objects have to be added in blocks group. Select text icon on left tools panel and put a text object on top right corner of map. Write “0” as text will represent points. Rename text object in Objects panel on the right side. We have finished graphical part of tutorial. 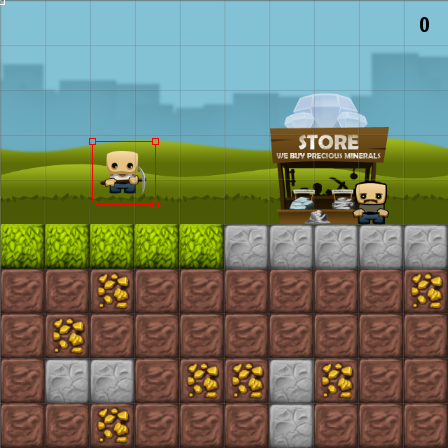 Next we’ll go in to coding and adding functionality like character controls, collisions, etc. Switch to source editor on top left side. On the left side menu with game files are displayed. You will have to code mostly in state/play.js file. You can find key shortcodes for the editor here. For coding we are going to use Phaser development framework. The states in Phaser are a separate parts of the game logic. By default editor gives you a template with four states boot, load, menu, play. For each state there are some predefined methods: preload, create, update, render. For demo purposes you should know that create method is called right after all assets are loaded and update method is called by game loop 60 times a second. You can learn more in documentation. By default template calls load state. We need to redirect to play state. For this edit menu.js file under create method. First open game from top panel Open game button. At the moment there is only black screen. To display just made objects we have to initialize them in play.js file create method. Initializing is done with mt.create function. “bg” and “blocks” represent group names in object panel on the right side. “shop” and “character” represent sprite names in the same panel and finally “points” represent text. As you see all objects group, sprite and text are initialized with the same method. Open the game now and initialized objects will be visible on the screen. By default physics are disabled in Phaser for better performance reasons. We will enable the lightest and fastest physics from all available – Arcade physics. Open physics tab in bottom right corner. Change parameter enable to 1 and rest of parameters will appear below. Set character body size width: 60 and height 60. Enable gravity and set y to 1000. At last set collideWorldBounds parameter to 1. Opening game you will see character falling down to the bottom of the screen. Initialize cursor keys in create method. This function give us an object with the four arrow keys to play with: up, down, left and right. In update method we will track when left/right/up arrow key is pressed and give a velocity to character or stop it keys are not inactive. Open game and try arrow keys to control character. 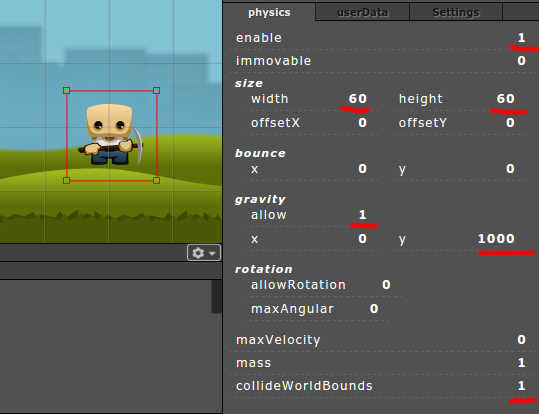 Enable physics for blocks and set them immovable in the Map editor bottom right physics panel. Next add collision detection in update method. First two arguments declare that we will check collision between sprite object and group of object. Third argument is a 2 argument function which is called on collision. Opening game you will see character won’t fall to the end of screen, but will land on top of the blocks. 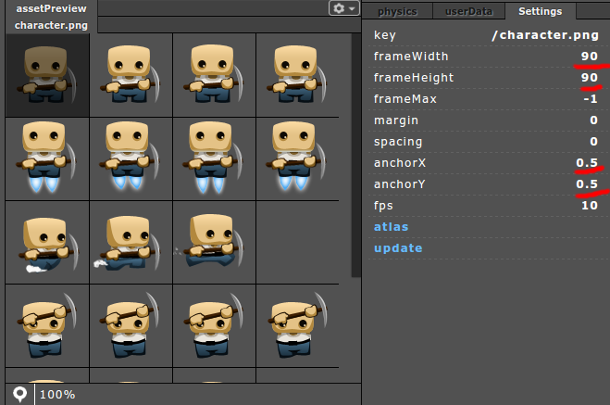 First we need to define frames in spritesheet for different types of animations. Add these lines in create method. Last line of code starts play default animation stand. For rest of animations we have to change update method and add play specific animation for each key press. Note that we have the same animation for left and right run. In order to flip horizontally sprite we are using scale -1. Various blocks need to be handled differently. Grass and ground blocks are simply destroyed, rocks are indestructible and we can collect gold and save it in character gold parameter. Add destroyBlock method under play state. We will add digging animations as final step of this tutorial and re-factor update method to meet our needs of good looking game. Given previous samples the code below should be self explaining. Hi, I’m looking for MightyEditor, you’ve done a good job from my last visit! I’ve just a question: in the loadProject, I’ve some random projects that I’ve never created, instead of the Tmp project that I’ve just created. Are the projects data stored locally? at the moment – projects are stored in the local storage at browser side. 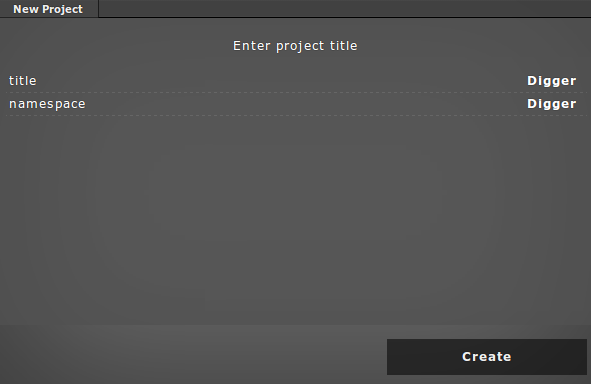 Now id is added to the project only after you create new project. In the loadProject menu – script checks local storage entries and displays all projects that are stored there. For older projects it shows pd7s (pd7s) and for newer – ProjectTitle (pd7s). Your only link with your project is project_id – it is recommended to save it ( or bookmark it). Theoretically it’s impossible that loadProject menu would show some random projects – it just shows all that can be found on browsers local storage. And finally if you have open project and then goto Project -> clone – editor will copy current project and assign new id to the copied project. This is temporary solution as it isn’t very useful an you can clear that list accidentally. This functionality will change with user account feature. One question to your awesome tutorial, how would one separate the character into its own js file? Open SourceEditor and click top icon from left tool panel thus creating a new file. Name it “character.js” and drag in whatever folder you want. Finally include script in index.html head section. Basically workflow is the same as any other code editor. really cool … the tool and the description of the tutorial. 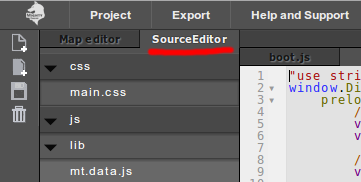 But I have a problem with the sourcecode editor. I can’t click on a special position to write there some code. Every time I click the lines are jumping, or adding a new clear line I’m not shure. Maybe there is something to do bevor using the editor? which browser do you use? Currently we are testing Google Chrome only. Nice! Thanks. Is there any kind of documentation of such abstractions. Another question if I may ask! 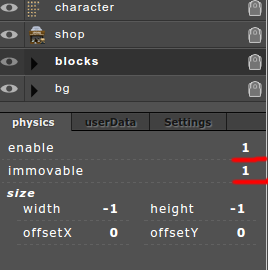 I have to add new sprite to the group of blocks through code how to do that ? I have did the above, but the sprite will disappear. Try it for your self. You can find texture name clicking on it and in settings panel find key parameter. For example for gold block texture name is “/gold.png” . You can also change the name. This is a great tutorial and I’ve followed it all the way through and plan to use it with some children at my school to teach them MightyEditor. However, I want to expand the basic game to include more features. One of these is making the map bigger. Due to this I want the camera to follow the character around, but can’t work it out for the life of me! But as I say, I can’t get it working. Any ideas, please?! At the end of create: function() and altered the world size accordingly and it works! Loving MightyEditor, by the way! Hi – I’ve followed the tutorial above (and the youtube clip) but I can’t get the character to respond to the cursor key input? It responds to gravity when I open the game from the editor but won’t move thereafter. Have you initialized cursor keys? I have the same problem! Can you help me? I have inizialized the cursor keys. I explain my problem with the video. Hi LLS, I’ve checked your project and everything worked fine for me. Maybe you have some error in Console (F12)? Check it and report if you have. Thanks a lot. I did the programming errors . Now it’s all right . If I were to have other problems I will contact you . Thanks again for this software . It ‘s wonderful . I will try to study it thoroughly . I have to create an interactive map in a website and must appear as a video game with a character that moves within it . Mighty Editor is perfect for this need. I’ll give you another question . Can I add a second player or more ( multiplayer ) ? Currently there is no multiplayer option in editor. One thing you can do is to create a client side game in editor, export the game and add server side (multiplayer) code on your PC. Thank you. Tomorrow , I will return to study the tutorials . Now I’m tired . I go to sleep . Thanks again. Good Night. useful & it helped me ouut much. I’m hoping to provide something basck and aid others such as you helped me. Hi I am working on a small project and found this really helpful but I have a question. I need to set up a 3×3 tile map. I also need the tiles to for example disappear when clicked. Could you show me an example piece of code on how to do that? HI there. Fantastic editor and tut! I did notice that for some reason, the amount of gold only updates upon colliding with the shop. How could we fix that? Did you do change something to fix that? 10/11/2012OK My favorite game is cresis 2, All i know is the character i chose was an injured solder that was given the suite to fight off the aliens. Some how the suit is keeping him alive. I love the way they designed the suite and keep you up to date by explain how the suite works. Hi ! Thanks for this editor, this is wonderful! Just i write a comment today for a little problem. I follow this tutorial but when I launch my game (with the editor or in my local PC), and I have just a picture of a white horizontal bar…. Firstly, I think this is because I am in Mozilla Firefox but no, that is the same on the last version of Google Chrome… I follow the video tutorial too, and i’ve picked up your project for test, so I have change NOTHING…. Don’t know why there is this problem… Need help, thanks in advance ! And thanks for this editor ! It’s great to hear that you’ve finally “found your voice”, Michael. More posts about you as a person wo#u1n&l82d7;t be unwelcome â€” it’s a good reminder that the most knowledgeable people in any field are still learning and striving to improve. Imponente Ordesa y su entorno. Lo que si te aseguro que con mis vÃ©rtigos no podrÃ­a ni asomarme a ese Puente Arripas. Mucha presiÃ³n de agua como para no sentirte atraido por la corriente cuando atravieses esa pasarela que por su escasa apariencia no transmite mucha seguridad, que di0&mosa#823g; Feliz estancia. he had another one with the bayonet an ask me if I wanted to do another trade. I was able to get the other one for 300 rounds of Chinese SKS ammo. I had a bent bolt and scope put on the first one, but bought a second bolt to be cut off because I did not want to cut the bolt with the oriaingl serial number on it. I have been using it for deer hunting and have gotten at least one deer for the last three years. I love the fact thats it is very cheap to shoot and been having lots of fun with it. The Sunday classifieds being a excellent spot to snag several really good coupons inside them. My last loaf turned out like this too, although it wasn’t the “no-knead” type. My friends told me that you have to use a little bit of white flour, because whole wheat flour (or rye, I suppose) is just too dense. Did you install Jetpack on your device? Yes. I have uninstalled the jetpack. It looks better, I can see the video from the hkej.com but not quite smooth. And does your stock browser have the same problem? Native browser has similar problem too. Copertile imi amintesc de cartile cu basme din copilarie. La fel si povestile, sau numele personajelor. Nu stiu daca as citi asa ceva, adica imi par copilaroase, sau poate cartile nu sunt asa de copii scrise si pe parcurs o fi interesant. Hallo Chirstiane,danke für den Hinweis. Wollen wir doch mal sehen, ob sich ein Qualitätsjournalist seine Sporen verdient. Seltsam, dass die Weapons of Massdesinformation darüber noch nichts gebracht haben oder habe ich das nicht mitbekommen, ich schaue ja fast nie fern. Jag blir sÃ¥ lycklig av att tÃ¤nka att pÃ¥ att din dotter fÃ¥tt just dig som mamma!!! TÃ¤nk vilken himmelsk tur!!! Amazing indeed. Someone should ask the Eminent Senator from Nevada if he has an iPhone – and remind him that it is assembled in China (and many parts made in China). This, of course after a bonfire of clothes in his wardrobe that were made in China – or of items in his home, office that have components, systems made or assembled in China.